During World War II, Bartik was one of a group of six “computers” — the job title of humans hired to run math problems to compute the trajectory of ballistic shells. In 1946 they were given a new tool that took the army three years to build at a cost of $500,000: ENIAC, or “Electronic Numerical Integrator And Computer” — the first general-purpose electronic computer. Thus, Bartik’s group were the first computer programmers. ENIAC contained 17,468 vacuum tubes, 7,200 crystal diodes, 1,500 relays, 70,000 resistors, 10,000 capacitors, and about 5 million hand-soldered joints, and weighed more than 60,000 pounds. 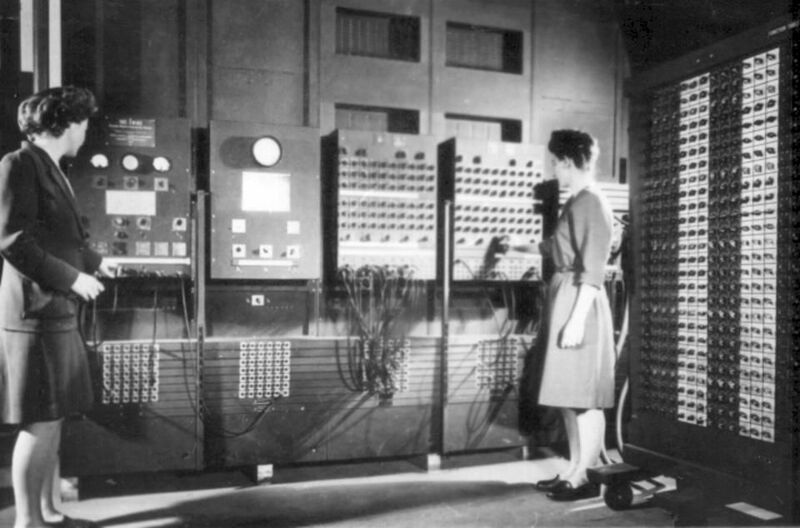 ENIAC’s console with two of the programming team, Betty Jean Jennings (left) and Frances Bilas. U.S. Army Photo from the archives of the Army Research Laboratory’s Technical Library. It was a balky machine: the longest it ever ran without crashing was 6 days, and crashes often meant the need for physical repairs. But the “computers” — those like Bartik who programmed it, all women — worked around those limitations, and the project was a huge success. 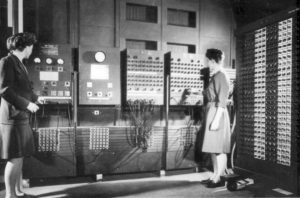 ENIAC was not shut down until October 1955, and Bartik went on to work on the BINAC and UNIVAC computers. “Today there are over 1.4 million programmers and software developers in the United States,” said Jon Rickman, director of the Jean Jennings Bartik Computer Museum at Northwest University, “and Jean Jennings Bartik was the first.” She died March 23 after a stroke. She was 86, and was the last of the ENIAC programmers alive.